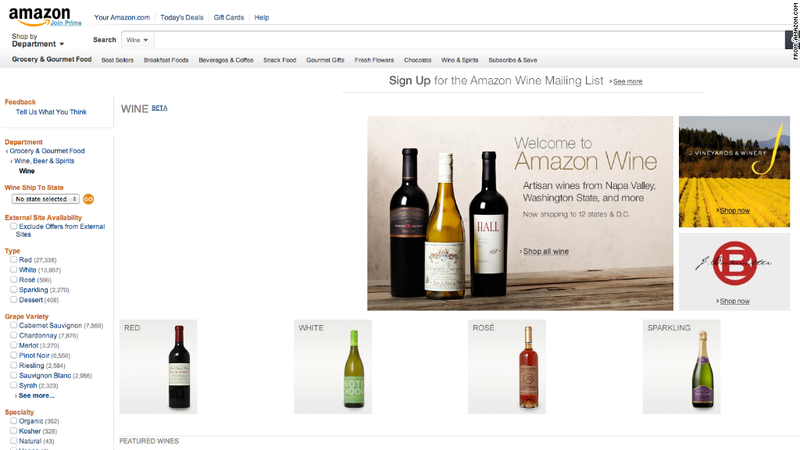 When it comes to selling wine, Amazon won't give up. On Thursday it launched Amazon Wine, its latest shot at a red-tape-wrapped market that the e-commerce giant has struggled to crack. Amazon Wine operates more as a middleman, offering customers a selection of around 1,000 wines at prices ranging from $5 to $200. A $10 shipping fee covers up to six bottles of wine. A tangle of state regulations make it almost impossible to directly deliver alcohol to buyers in some states. For now, Amazon Wine is only operating in 12 states -- California, Connecticut, Florida, Idaho, Illinois, Iowa, Nebraska, Nevada, North Carolina, Oregon, Washington and Wyoming, plus Washington, D.C. -- but Amazon says more states are "coming soon." Amazon's vast retail catalog spans nearly every product category, but its past efforts to sell booze have been pricey failures. It first took a run at the wine market in 1999 with a $30 million investment in WineShopper.com, a San Francisco startup that went bust in the dot-com collapse. Ten years later it tried again through a partnership with New Vine Logistics, a shipping service that went bankrupt after new California regulations wreaked havoc with its business model. This time around, Amazon (AMZN) is outsourcing most of the work. Its site will funnel sales to the wineries it works with, which will directly ship their products to Amazon's buyers. "What Amazon is doing now is putting more work onto the wineries as far as compliance and shipping," said Sara Mann, an attorney with Hinman & Carmichael who previously served as the corporate counsel for both New Vine and WineShopper. "They aren't trying to manage all that themselves," she said. "That's a more sensible way to go about it." Amazon is charging wineries $40 per month to join Amazon Wine, plus a 15% fee on each sale, according to Francis Ford Coppola Winery, one of the participating wineries. An Amazon spokeswoman declined to comment on the program's fees. Amazon is also experimenting with a $49 "cooperative fee" on each $350 in sales, but that fee is being waived for now. "It's a great opportunity to get our wines in front of a large number of people," said Marlow Daniel, a spokeswoman for Francis Ford Coppola Winery. "We are viewing it as an extension of our e-commerce business as the holidays approach."